Listen to a 24-minute edit of the Thai psych jam band’s catalog. 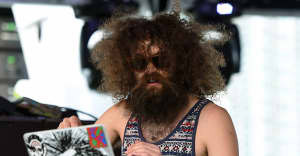 Gaslamp Killer, too, has been charmed by Khun Narin. The Brainfeeder producer has abridged the multi-generational Northern Thai psych set's two albums—their 2014 debut Khun Narin and its more recent follow-up II—into a perfectly digestible 24-minute jam, which premieres today on The FADER and will be sold IRL via Innovative Leisure throughout the month of April. "Ever since I heard Khun Narin's music, I felt like they were a lost treasure that needed to be spread to all humanity far and wide across the planet to heal people," Gaslamp Killer, whose real name is William Benjamin Bensussen, wrote in an email to The FADER. "It's truly some of the most spiritual and fun music simultaneously, which is very hard to find now a days!!" Physical copies of the mix come free with the purchase of a Brain Dead designed Khun Narin tee (see below) at Innovative Leisure's pop-up at Space 1520 in Hollywood while they last. Fall in love with Khun Narin below, then cop their two albums on here.